Barely runs. I tried oiling the motors, but still barely runn, and stop immediately when turned off. They spin by hand without obvious binding, but not many turns before they stop. Pull about an amp each. Suggestions? False alarm. I let them run a little while, adding oil, and now they run great! Just returned home, they were a little slow to get going, didn't time it but seemed a minute or more. Maybe they just need to get used to the taste of oil again? Thanks Tom. This is a really neat little device; I like how each unit can be removed and used seperatley, or together as a window fan. Sweet score Richard. It looks in exceptional shape. That’s the only window fan on my wish list. Thanks Steve. The paint isn't horrible, but isn't great either. has some scrapes here and there. Cords are great. What year did they make this fan, anyone know? 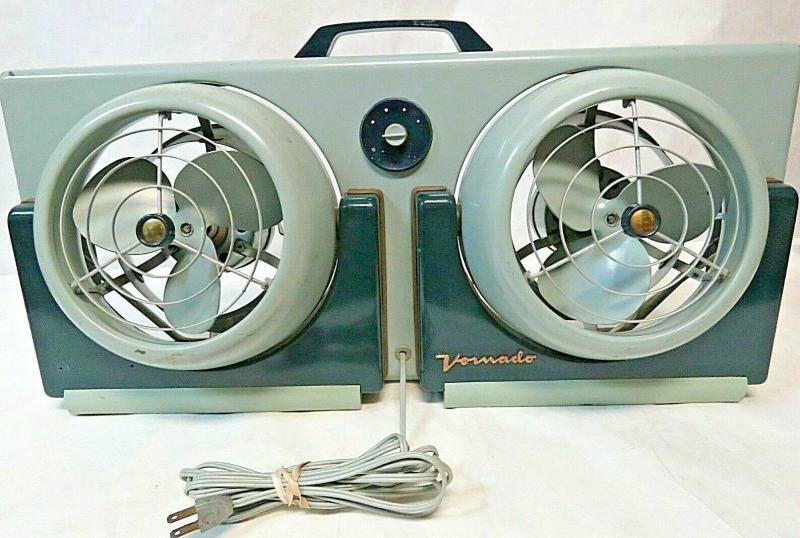 I believe these Vornado Window Fans are from the 1950s. Page processed in 0.1645 seconds (19% database + 81% PHP). 27 queries executed.